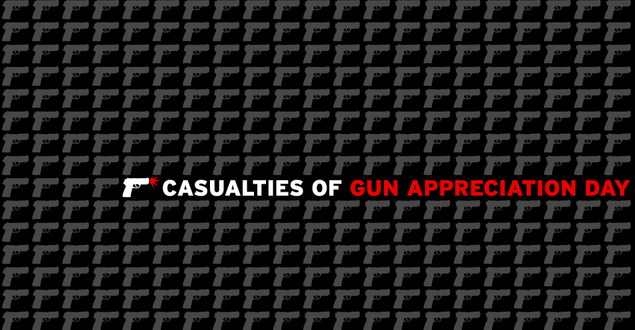 Here is a list of people injured or killed by guns on ‘Gun Appreciation Day.’ Thank you to Gawker for pulling this list together. A 14-year-old suburban Atlanta boy shot and killed his 15-year-old brother while playing with their mother’s handgun. A 26 year old was shot and killed while driving in San Francisco. A woman in an El Paso County, Texas shooting range was hit in the knee by a bullet that ricocheted off a trash can. Two women were shot to death in a Dallas-area home. Two women were injured after someone opened fire at a crowded soccer field in Las Vegas. A 15-year-old girl was shot while sleeping in her bed when her Anchorage home was shot at. A 7-year-old boy in Tallahassee shot a 5 year old with a gun he found in a 22-year-old relative’s room. A Huntsville woman shot her boyfriend after the two had an argument. A 23-year-old man died after being accidentally shot in a Greshman, Oregon home. A Cleveland father has been charged in connection with the death of his 6-year-old daughter from a self-inflicted gunshot wound. A man was found shot dead in a parking lot in Greenville County, South Carolina. Two people were shot and killed outside an inn in Hampton, Virginia. A Colorado Springs man was driven to the hospital with a gunshot wound. One man was shot at a Martin Luther King Jr. parade in Jackson. An 11-year-old boy was shot in an Oklahoma City apartment complex. Police believe gang violence is to blame for the shooting death of one man in Santa Ana, California.